‘Tis the season for family, friends and lots of delicious food – but with this also comes the possibility of distress for our fur friends. Pets won’t be so thankful if they get their paws on some under cooked turkey, unattended alcohol, or perhaps a not so friendly floral arrangement. One thing pet owners can always count on is the presence of excited, curious and hungry animal companions. When they look at you with those big puppy dog or kitty cat eyes, begging you to toss a nibble or something their way. You want to give in, but should you? For many reasons, probably not. Thanksgiving is a time everyone should enjoy, including your animal companions. Have a read of our tips for a fulfilling Thanksgiving that your pets can enjoy too. If you decide to allow your pet a little taste of turkey, make sure it’s boneless and well-cooked. Don’t offer raw or undercooked turkey meat as it may contain salmonella bacteria. Sage is great for Thanksgiving stuffing, but along with many other herbs, sage contains oils and resins that can cause gastrointestinal upset and central nervous system depression to pets. Cats are especially sensitive to certain oils. Yep, bread dough is a big no no! When raw bread dough is ingested, an animal’s body heat causes the dough to rise in their stomach. This may cause vomiting, severe abdominal pain and bloating, which could become life-threatening and require surgery. Keep in mind that if you are baking up a Thanksgiving cake, that you pets keep their noses out. Cake batter, especially if it includes raw eggs, may lead to food poisoning in pets. A bit of turkey, a munch of mashed potato and a lick of pumpkin pie shouldn’t pose a problem. However, don’t allow your pets to have an excessive amount as they may end up with a case of stomach upset, diarrhea or even an inflammatory condition. It’s best to keep your pets on their regular diets during the holiday season. 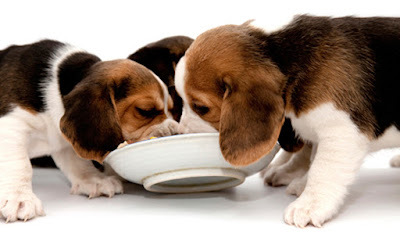 While the humans are enjoying their meals, give your pet their own little feast. Try stuffing their usual dinner – perhaps with a few added bits of turkey, vegetables (try sweet potato or green beans) and a dollop of gravy inside a Kong toy. Do right by your fur friends so they’ll be around to enjoy many future Thanksgivings right by your side.